I'm a bit ashamed to admit I'd never read anything by Juliet Marillier before and pretty much EVERY fantasy fan I've met has been singing her praises, so there's really no excuse. I think I even own one or two of her earlier books. But now I have and consider me converted! 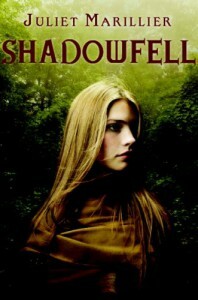 Shadowfell is the beginning of Neryn's epic journey, it's the classical hero's journey, which I happen to love. Neryn's a girl who's been through a lot and has come out stronger for it. She keeps going even when things look hopeless and I was cheering her on every step of the way. I loved seeing how she grew into her canny skills and discovered more about herself. I especially appreciated one scene towards the end in which she faces all the loved ones she's lost, I felt for her pain there and it added a new level to Neryn's character. And then there's Flint. A guy I'd probably fall in love with in a heartbeat if I'd been Neryn. I really enjoyed seeing the friendship grow between them even though they both have major trust issues. At least their trust issues are based on actual problems. Flint is mysterious and troubled and it's not always clear what his motives are exactly, but I just wanted to hug him. And I absolutely loved him in the final chapters. The world Shadowfell is set in is really interesting and intricated and I think we've only seen the tip of the iceberg with this first book. There have been hints of creatures and places that I'm really excited about seeing for myself as the series continues and I REALLY want to meet Keldec, the tyrant king. Shadowfell is my kind of epic fantasy and while some of it was a bit slow, I was thoroughly enjoying myself reading this book! I think the next book will give us more magic, epic battles and just all around fantasy goodness. Also, I want to see more of this lovely, sweet romance we've only seen the beginning of.